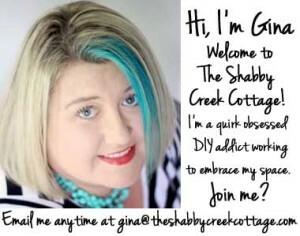 For a couple of months now I’ve been joining my buddy Jenna to share the basics of using power tools. Last month we talked about which saw to use, so this month I’m going to start by talking about how to use a table saw. I’ve been around lumber my whole life, because one of my grandfathers owned a sawmill. My uncle worked there, my brother worked there, even my other grandfather worked there during the farming off season. And even though I’ve worked at one myself, I don’t know all of the technical lingo. But I can run a saw with the best of them. I’ve never been scared to use one because I was taught proper safety from a very young age, so let’s fire up the saw and get to cutting some lumber! 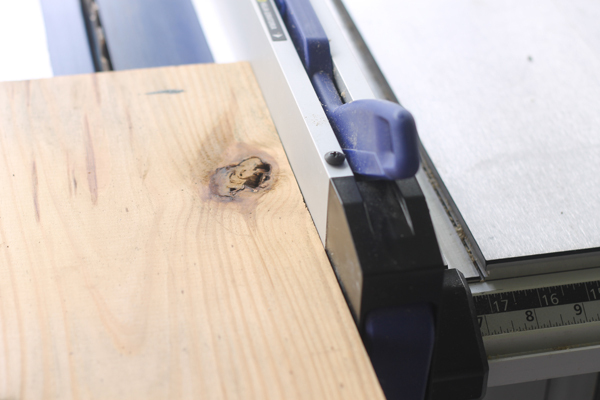 Like I explained in the last PT101 post, a table saw is the perfect tool to use when you need to cut down big sheets of wood (like plywood) or long lengths into narrower strips. Let’s say you need a piece of wood that’s 3 inches wide. Guess what – they don’t make it that size. You can either buy a 1×3 (which is technically 2 1/2 inches wide) or a 1×4 (which is 3 1/2 inches wide.) To get it to exactly 3 inches you’ll need to rip it down – and we’ll get there in a sec – but first let’s learn a little about the saw. Table saws have a few parts to them, besides the table and the blade. There’s a crank (location will depend on your brand) that makes the blade go up or down (as in taller or shorter according to the table.) That same blade control (on my particular saw) will also control the tilt of the blade. (Not all saws are the same, so read the instructions.) There’s also a power switch to turn the saw on and off. And then there’s the guide rail, which gives the wood a straight edge and clamps onto the table of the saw so you can measure out the side you need to make sure it’s the perfect width. 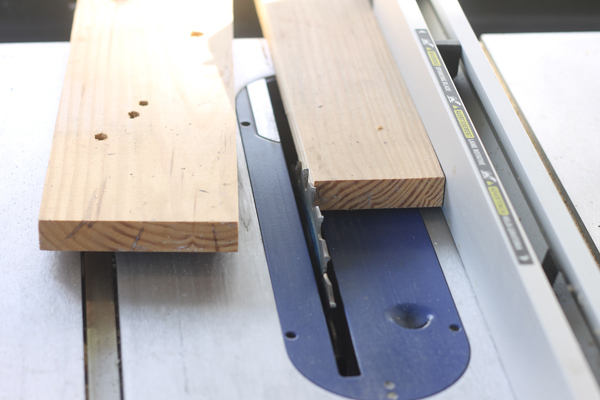 Adjusting the width of the table saw is a tiny bit tricky, but not too hard. 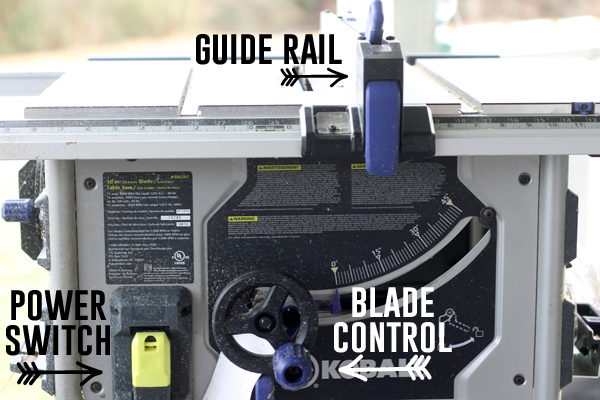 You want to remember to measure with the line of the tape measure on the side of the saw blade that is towards the guide rail. The blade will basically “eat” the cut line, so if you measure it to the center of the blade your cut will be off. 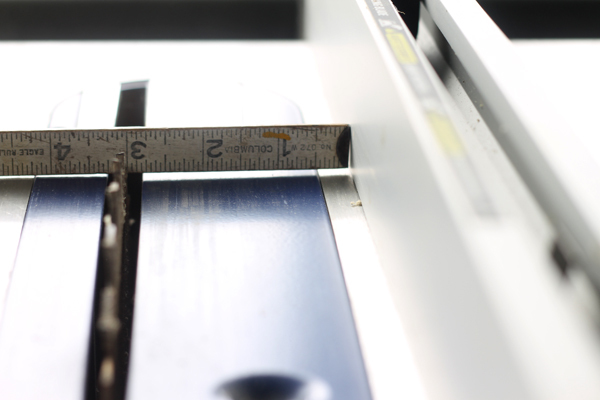 Measuring from the outside of the blade will ensure you have it properly set to go. The guide rail will have a clamp on it (in some way) to release it from the table and adjust it, then clamp it back to the table so it will be secure and hold your wood in place without a problem. Once you have it set, then push the piece of wood up against the guide so it is flush. (Make sure you’re wearing safety goggles!) 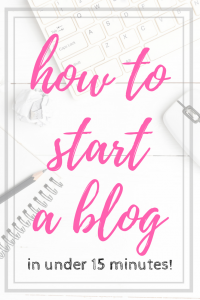 Start with the board away from the blade, turn on the saw and then push the board towards the blade. Make sure your fingers STAY AWAY FROM THE BLADE! Slowly push the wood towards the blade so it can cut it cleanly. 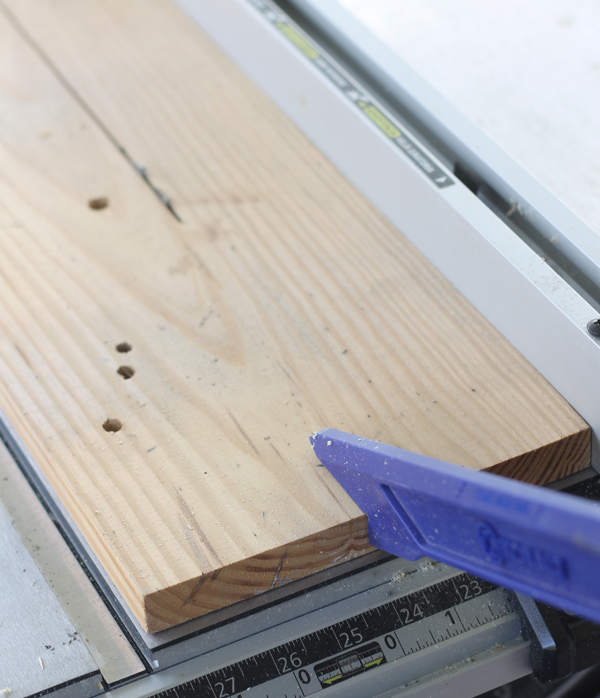 When you’re 12 inches or so from the end of the board, use the tool that comes with your saw to push the board the rest of the way so your fingers are not in danger. Be careful of backlash, do not stand directly behind the board but off to the side a bit. A fast blade plus the light board means that sometimes the blade spins the board off and makes it kind of fly out of the saw. It hurts – so avoid it by giving it room in case it happens. Once you’ve pushed the wood all the way through, then turn off the blade and you’re done! 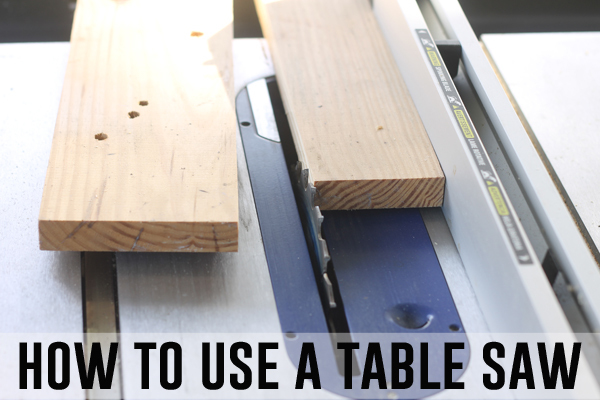 There’s a lot more you can do with a table saw, but this is a very basic post – maybe we’ll do Table Saw 102 at some point? If you have questions, just let me know and I’ll do my best to answer them in the comments below! How do you handle a large piece of plywood? Can it ever be a one-person job, or do you need two sets of hands? I just can’t figure out how to hold the weight of the large piece of wood and push the wood through smoothly. I’m so glad you’ve tackled this saw. I’d really like to invest in one this year. I’ll probably pick up ear plugs, too. It’s not necessarily the saw itself that scares me, but the noise makes me cringe. Does the blade height have anything to do with backlash? Better yet, on a board 1″ how high should I set the blade to safely cut it through?